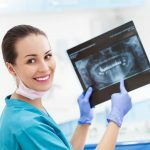 Home » How Do Dental Implants work? Dental implants are metallic frames that are inserted in the jawbone by surgical procedure. The implants make it possible for the dentist to insert replacement teeth into place. Implants, though an expensive procedure, are the most effective restorative method available today. Smile LA offers these procedures at convenient prices. We have a team of qualified dentists who are experienced in dental issues and whose goal is to improve your smile. Since the dental implants get bonded with the jawbone over time, they provide firm support for the installation of artificial teeth. Dental implants hold dentures and bridges intact in place. This saves the patient unnecessary worry and discomfort as they try to keep them from falling off or shifting in the mouth. This ensures safety while eating or drinking. Unlike dentures and bridges that have to be held onto adjacent teeth for support, this is not the case with implants. This means that the adjacent teeth don’t have to be fixed to the new replacement teeth in order to support them. This results in a more natural feel which is comfortable and relaxing. There are two procedures for inserting implants on the patients that the American Dental Organization has declared safe. Our center provides both types of dental implants. The choice of the type of dental implants to work with is mainly up to the patient, and the dentist will help them to choose the suitable option after explaining the basics of each. This kind of implants is surgically implanted deep into the jawbone for the strongest anchorage. As the implant bonds with the jawbone, the surrounding gum also heals and covers the implants completely. A second surgical operation is done later to attach a pole to the implant. The artificial crown to replace the tooth is then attached to the post and fitted into place. This kind of implants is in the form of a metal frame inserted in the jawbone slightly under the gum tissue. As the gums heal, the metal frame gradually bonds with the jawbone. This provides a firm and strong support. After the gums heal they leave the posts, which are connected to the metal frame, protruding over the gums. Artificial teeth are then fixed onto the poles, and the patient gets the appearance of a full set of teeth. Smile LA is dedicated to handling your dental concerns making them stress-free to you. If your damaged teeth are affecting your confidence and social life, do not despair. Book an appointment today for our dental implants procedure, and you will get your bright smile restored. We are equipped with the latest equipment in the field for the procedures, and our results are always appealing. We also have a team of qualified dentists who carefully take you through the procedures with quality care and treatment. Our centers are designed to give the patient a feeling of home and comfort and our staff will also ensure your experience with us is worthwhile.